I ran to the museum’s cafe, though on another day I would have headed to one of several worthwhile restaurants nearby, such as Café Murillo, a local joint that is popular with both stylish madrileños and Michelle Obama (whose been twice), or Trattoria Sant’Arcangelo, a cozy Italian spot that often serves as the cantina for senior Prado staff. In warm weather the museum has a lovely outdoor cafe with yummy sandwiches and yummier sangria that might have kept me from going back inside to finish my mission. 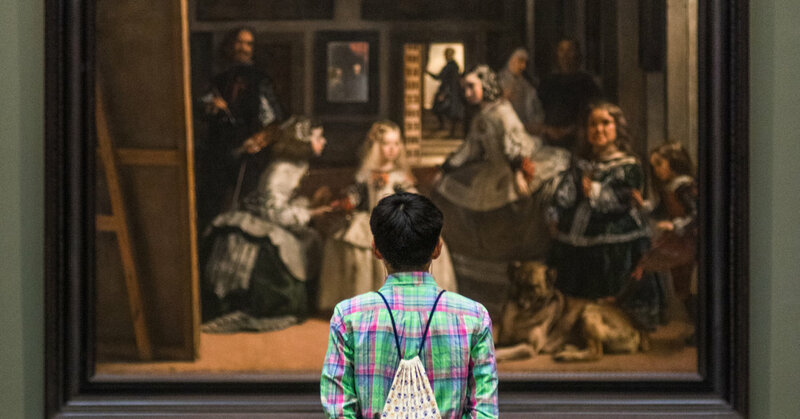 “Velázquez alone is worth the whole trip,” wrote the French painter Édouard Manet of his Prado visit in 1865. Velázquez, he noted, is the “painters’ painter,” so little wonder that the likes of John Singer Sargent, Pablo Picasso and Francis Bacon would make similar pilgrimages to study the works displayed in Galleries 7 through 18. Artists of the Spanish “golden age” in the 17th century seemed to delight in manipulating paint on the canvas to create dazzlingly realistic effects, such as the light shimmering on silk gowns in Velázquez’s “Las Meninas,” or the churning clouds in the apricot-and-lavender skies of El Greco. Spanish ‘naturalism’ — painting objects and people as they actually appear — can have a deeper emotional impact, as seen in the candor and humanity of Velázquez’s portraits of buffoons or the austerity of Zurbarán’s nearly all black-and-white paintings, like “Agnus Dei,” which conveys the solemnity of Catholic Spain.